It’s been well over a year since a massive earthquake and tsunami devastated the Fukushima Daiichi nuclear power plant in Japan. During early stages of the fallout, Japanese officials insisted that radioactive contamination did not pose a serious danger to humans or the environment, but in the months that followed, evidence has suggested otherwise. A study published recently in the journal Nature provides evidence that the collapse of the Fukushima Nuclear Power Plant released a huge amount of radioactive materials into the environment. According to the research, this contamination is already causing physiological and genetic damage to a species of butterfly that used to be common in the region. Unfortunately, it’s still too early to evaluate the full biological impact of the Fukushima nuclear fallout on all animal species in the region. 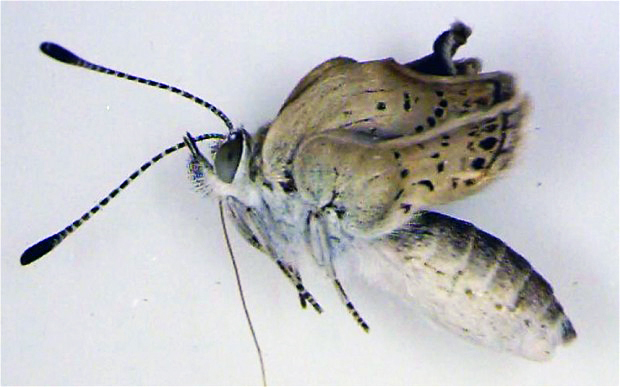 But if what’s happening to the the pale grass blue Zizeeria maha (a common lycaenid butterfly in Japan) is any indication, it’s severe and scary. According to the study, some of the butterflies had abnormalities in their legs, antennae, and abdomens, and dents in their eyes. Researchers also found that some affected butterflies had broken or wrinkled wings, changes in wing size, color pattern changes, and spots disappearing or increasing on the butterflies. is this true or was the butterflies already mutated well before the Fukushima incident? really. i am just curious. were the study consistently made since years before or? there are much to be answered. really. anyway, humans are just unappreciative, everyone has enjoyed the fruit of the nuclear power plant but when something goes wrong, they started to point fingers. typical. Japan, like any developed countries, is hungry for electrical power, so the price to pay is either suffer with smog or radioactive. until alternative 'clean' energy is capable of supporting millions, if not billions, of people's demand. It's been well over a year since a massive earthquake and tsunami devastated the Fukushima Daiichi nuclear power plant in Japan. During early stages of the fallout, Japanese officials insisted that radioactive contamination did not pose a serious danger to humans or the environment, but in the months that followed, evidence has suggested otherwise. A study published recently in the journal Nature provides evidence that the collapse of the Fukushima Nuclear Power Plant released a huge amount of radioactive materials into the environment. According to the research, this contamination is already causing physiological and genetic damage to a species of butterfly that used to be common in the region.